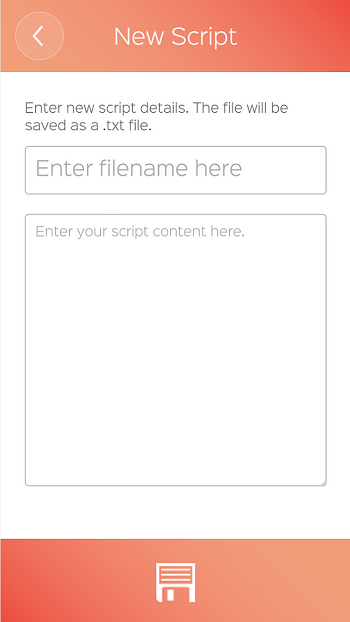 Our free teleprompter software is easy to learn, has high contrast text, scrolls smoothly, has adjustable speed options, and can handle long scripts. 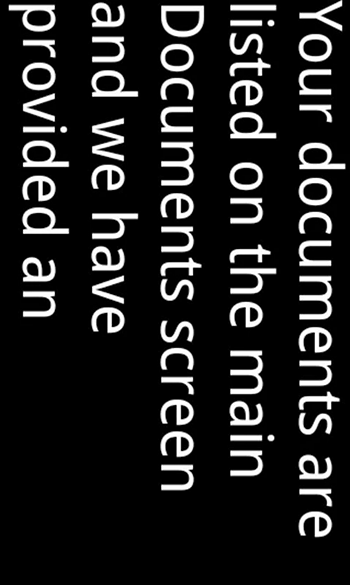 The autocue text can be flipped to a mirror image so that when you view it off a mirror, it appears normally. 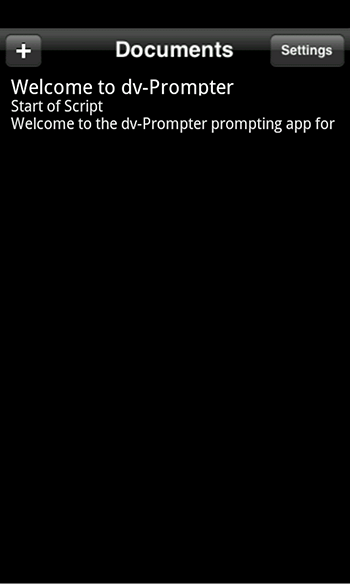 dv Prompter is a full function teleprompter scripting application suitable for Android devices. 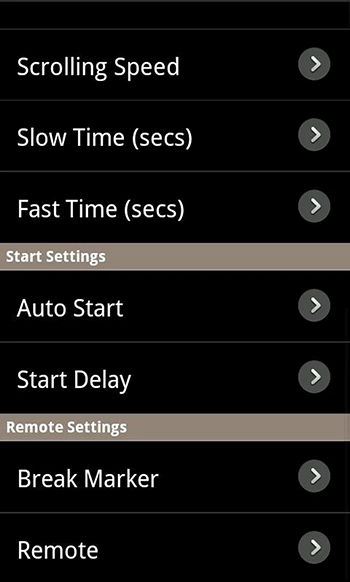 Used standalone the app can be used with the expanding range of wired, wireless and Bluetooth remote controllers. Combined with the Datavideo TP-100, 200, 300, 500 and 600 range of teleprompters, your Android device is mounted on or off-camera in a professional rig. 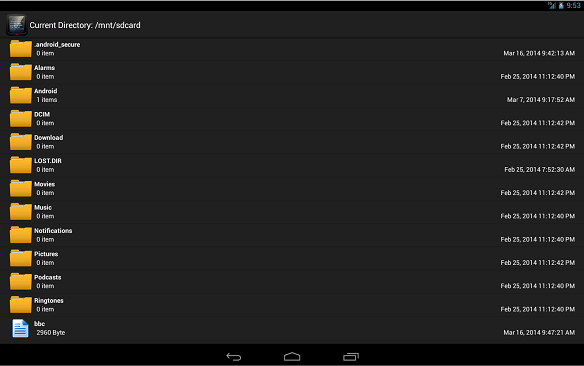 All hardware products are available from the global network of Datavideo resellers which can be found from the splash screen at the start of the app. 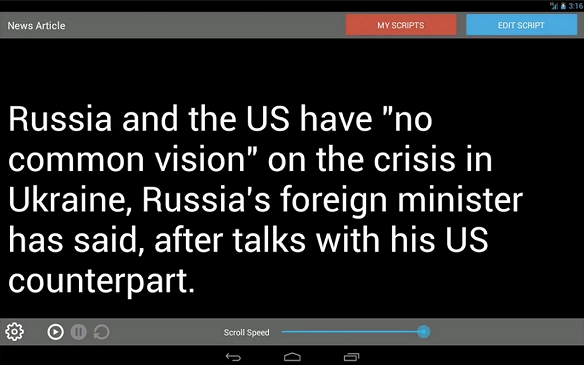 Teleprompter Pro is the professional teleprompter system for your Android phone and tablet. 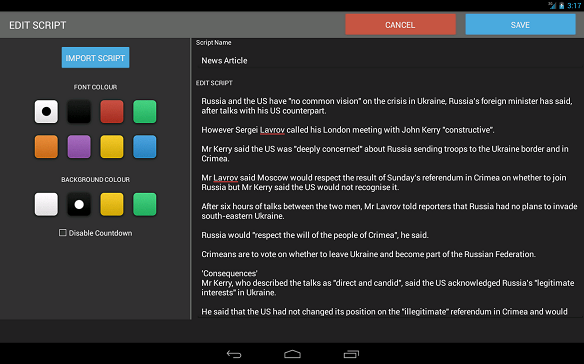 Teleprompter Pro is a great AutoCue style app for presentations, lectures, broadcasters, filmmakers, musicians & singers, business professionals, or any public speaking! 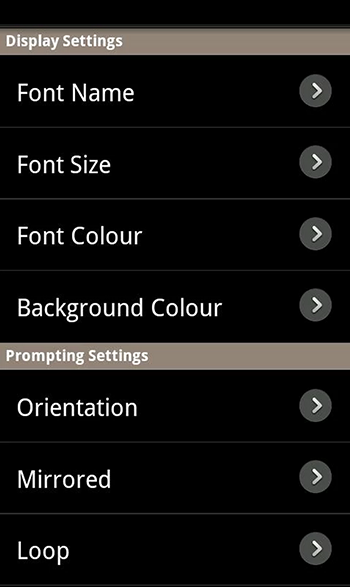 This Parrot Teleprompter companion app is easy to use, and has all the top requested features turning your smartphone into a high end professional teleprompter. 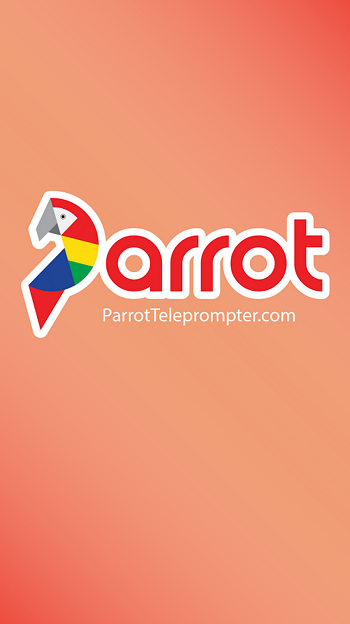 The Parrot Teleprompter is the world’s most portable and affordable teleprompter! At less than 4.5″ cubed you can take it anywhere you need to film your next video. 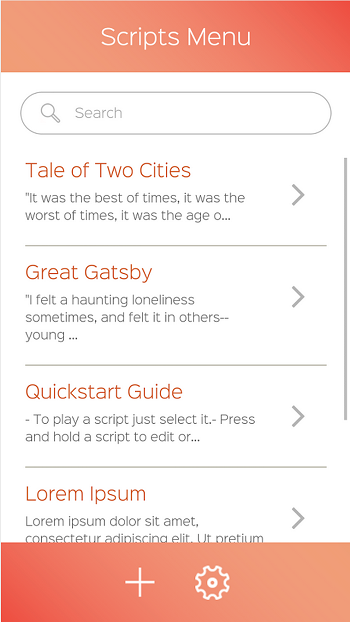 If you have ever tried to memorize lines for a video, then you know how challenging it can be. Teleprompters display a script in front of the camera so the actor can read their lines and maintain eye contact with the audience. 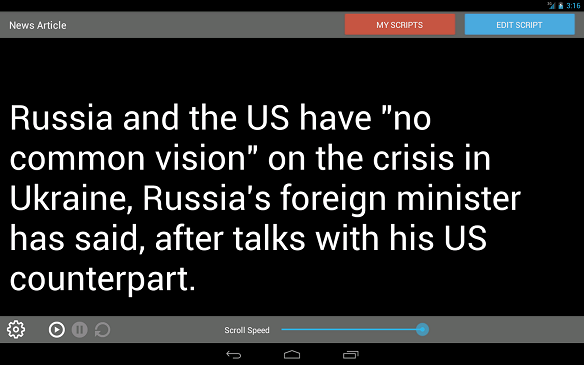 Until now teleprompters have been reserved for large budget productions often costing thousands of dollars each. The Parrot teleprompter is a professional quality teleprompter at an affordable price that still delivers a professional quality experience. 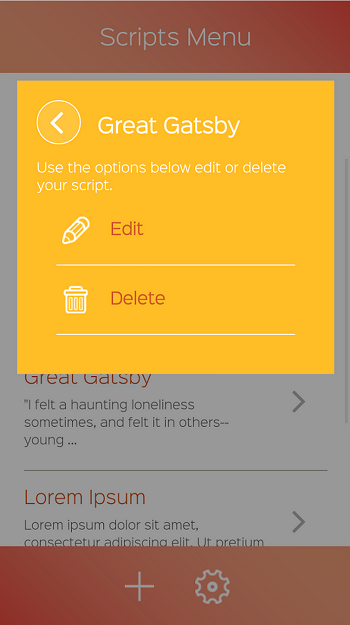 Combined with virtually any smartphone, the Parrot teleprompter will take any script and scroll it in front of you so you no longer need to worry about what to say on camera. It’s innovative design removes all the unnecessary components which allows you to mount the Parrot teleprompter directly to a standard DSLR or digital camcorder lens. It’s compact size makes it easy to throw in your camera bag and take it wherever you go for your next interview, on location news report, documentary, video blog, podcast, corporate video, video tutorial, or speech.